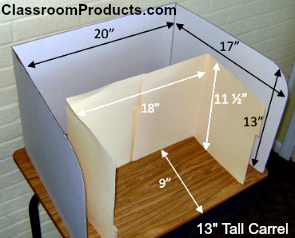 Cardboard Study Carrels | Should You Try To Make Your Own? Cutting science boards may seem to work! Science boards give you less than half the side protection of our computer privacy shields. Our computer privacy shields are 2” to 4” wider (L to R). Our computer privacy shields have a cut-out in the back for wiring. You could cut yourself and have to miss work and fill out lots of paperwork. You’d have different sizes, shapes and colors in the classroom. Not a pretty site. Our privacy shields fold up and store flat. It’s hard to find boxes that are free from printing on the outsideas required during testing. Once together, the folders only provide an 8 ½” x 17” work space. Our 13” and 20” Desktop Privacy Shields provide a 17” x 20” work space. More than double the folders. Laminating the folders for strength significantly adds to the cost. Bottom line is they just don’t stand up or last like our durable cardboard privacy shields. Our privacy shields have rounded corners to protect student bodies and eyes. Our privacy shields carry Two Million Dollars liability insurance. Our special manufacturing process guarantees the privacy shields will set flat so the sidewalls don’t swing. We ship our privacy shields the day after you place your order. Time is money. . . time for planning . . . time to get materials . . . assembly time . . . and most of all, time not spent doing what you were called to do . . . teach students. Want to download or print the information on this page? Use the button provided below.